Jann Wenner is selling a stake in Rolling Stone magazine to Penske Media, but staying on board as editorial director. Penske Media owns Variety, Women's Wear Daily, IndieWire, and other titles. It is making what it called a "strategic investment" in Wenner Media, the publishing company that owns 51% of Rolling Stone. The other 49% is owned by a start-up called BandLab Technologies. Penske's investment, announced Wednesday, values Wenner Media at "slightly more than $100 million," according to a source with direct knowledge of the deal. Both Jann Wenner and his son Gus are still shareholders. Gus will stay on as president and COO of Wenner Media. It is unclear how much of the 51% will now be owned by Penske Media. But Jay Penske, who runs Penske Media, said he is partnering "with the Wenners" to keep Rolling Stone thriving "for decades across multiple media platforms." 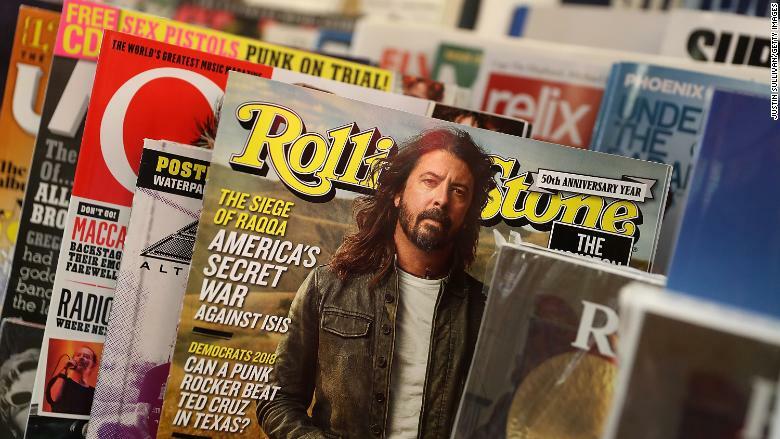 Like many other magazines, Rolling Stone has scrambled to adapt to the digital age and manage the decline of the print product. Joe Hagan, who recently published a biography of Jann Wenner, "Sticky Fingers," said that at first glance, the deal "seems pretty ideal" for the Wenners "because what they needed was cash." "I'm very curious to know what Penske gets for his money," Hagan said. "If he doesn't have control of the editorial, what is he going to control?" Penske Media said it would support Rolling Stone by providing digital media expertise and infrastructure, among other things. Back in September, the Wenners said their 51% stake in the magazine was up for sale. Several bidders emerged. Penske was seen as a leading contender. On Wednesday, Jann Wenner said in a statement, "I am so proud of our accomplishments over the past 50 years and know Penske Media is the ideal match for us to thrive in today's media landscape." Hagan said he was not surprised that the elder Wenner, 71, would remain involved as editorial director. Exiting the magazine "would be like selling off his right arm," he said. "He's got such a deep, personal connection to the magazine." But he also asked a question that doubled as a challenge for the new investors: "How much do you think the brand Rolling Stone resonates with anyone under 30 years old?"